What’s Behind the Mubarak Verdict? The headlines in the West will read, ‘Mubarak sentenced to life imprisonment.’ They may also say, ‘Egyptians take to the street in protest.’ Confused? Unless one reads more deeply the obvious connection must be that protestors wanted his head, literally. The reality is rather simple, just not within the headlines. Mubarak and the former Minster of the Interior Habib al-Adly were convicted, but the chiefs of the Ministry of the Interior were declared innocent. The statement says there was insufficient evidence to link them to the charge of killing protestors during the revolution. So the primary revolutionary reaction sees a political ruling pure and simple. 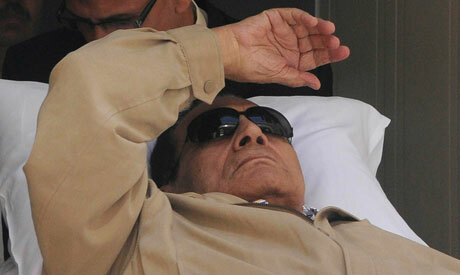 Mubarak and Adly were thrown under the bus – though many fear the case may be overturned on appeal. Meanwhile the figures on the ground who represent the backbone of the old regime are let free. The cry is that the regime is rebuilding itself, just in time for presidential elections. To add salt to the wound, Mubarak, his two sons, and other financial cronies were declared innocent on corruption charges. Therefore, this is where Egypt currently stands. A year and a half after the revolution, the president is in jail, but still no one knows who actually killed the protestors. What is far more curious is the estimation of what is going on behind the scenes. It is little coincidence that the verdict was issued today; closing arguments were presented months ago. The only difficulty is deciphering what the coincidence means. To preface, however, it must be stated first and foremost this may have simply been a ruling according to the evidence. Sufficient or otherwise, all involved may be honest men. It is noteworthy few voices are asserting this at the moment, though some have celebrated the achievement of a guilty verdict being issued against a former Arab strongman. Like the trial itself, it is a marked change in the traditional status quo. But it is much more fun to engage in conspiracy, however sad the fact it is still the traditional status quo. The immediate judgment, for which thousands have now descended to Tahrir Square, is that the old regime is defending its own henchmen, though Mubarak has outlived his usefulness. Fitting in with halting efforts at implementing social justice and real democracy, protestors see this judgment as one more nail in the revolution’s coffin. The final one will occur with the election of Ahmed Shafiq, by hook or by crook. Many of this ilk judge his presence in the run-off elections as due either to their outright interference, or to the fostering of conditions prejudicing the people to desire the return of law and order. How does the confusing judgment against Mubarak aid the Shafiq campaign? This removes the conspiracy one step beyond the revolutionaries who have been sucked in. Conspiracy number two has two prongs, the second nastier than the first. Then they will go to the booths and elect Shafiq. The second prong posits the conspiracy is not working solely for the preservation of old regime or military council power, but for a United States and Israel who desire to see Egypt devolve into utter chaos. Here, the powers-that-be are accomplices, but the Mubarak trial and the presidential elections are simply means to pull the rug out from under those whose appetite was whet for reception of power. This could be the socialists, or it could be the Islamists. The point, as mentioned before, is radicalization. A coming corollary to the manipulation of Mubarak’s trial could be the ruling on the constitutionality of parliament, or on the constitutionality of parliament’s law to isolate Shafiq politically, not yet applied. Any number of vague, unclear, or manipulative judgments on these issues could get people back to the streets en masse. Take care to watch if somehow or other the presidential run-off elections are ‘postponed’. At what point will aggrieved parties take up arms? This prong of the conspiracy is salivating at the question. The final conspiracy batted about is not nearly as nasty but nearly equal in cynicism. This has been heard most often by Coptic voices and some liberals, finding a scheme in the works to bring the Muslim Brotherhood to power. To introduce this strand of thought, it is noteworthy the Brotherhood has called upon members to take to the street in protest of the Mubarak verdict. Of course, drawing the Brotherhood in fits well with the different prongs of conspiracy two. Back before parliamentary elections the Brotherhood stood aside while revolutionaries were being killed on Mohamed Mahmoud St. They feared a trap, and did not want to jeopardize the elections in which they were poised to do well. As it turns out, pragmatically, they made the right decision. But though they won the great plurality of seats, they lost almost all of their revolutionary legitimacy. Now deeply committed to the presidential election, the Brotherhood is trying to claim it back. As Shafiq is clearly a non-revolutionary candidate, they must capture the revolutionary constituency if they wish to win. Now back at the square, they can either be discredited or radicalized, but conspiracy three posits otherwise. It notes the Brotherhood has been in close collaboration with the military/intelligence service since the revolution began. It furthermore asserts that Brotherhood-regime bickering has been mostly a show. The point at hand is in order to cede power to the Brotherhood legitimately, the population must embrace them democratically, and by a wide margin. A wary public and international scene would demand no less. Step one engineered the victory of Shafiq, to the detriment of other candidates with more revolutionary cred. Step two is to engineer crises in order to get the Brotherhood to lay claim to revolutionary leadership. Most revolutionaries have not bought any of the Brotherhood’s efforts at rebranding, but this does not matter much. They have already been strong-armed into at least a boycott if not grudging support for Morsy out of their deep conviction against the old regime. They have little appetite for an Islamist project, even if some to many have Islamic sympathies. But they feel they can deal with the Brotherhood whereas a Shafiq victory will crush them. But revolutionaries have no nationwide electoral weight, though the revolution bears much electoral sympathy. The conspiracy states the public is being shown every reminder of old regime corruption – gas shortages, shady court cases, financial fraud, and even the reconstituting of the Ministry of Interior – in order to lend their vote to anyone but Shafiq. Who would this be now, after the run-off? Only the Muslim Brotherhood, as all other revolutionary forces have been set aside. Since this scenario is so counter-intuitive to the traditional status quo, the question must be asked about why. The simple answer is that in order to remake the old regime, it needs the Muslim Brotherhood. Mubarak’s political power rested in the National Democratic Party, which was thoroughly dismantled – and headquarters burned – after the revolution. No suitable party exists to take its place, except the formerly hated Islamists. Of course, if this conspiracy is true, there are even more possibilities. The first is that the presidency is given to the Brotherhood for the same reason parliament was given – to discredit them in the eyes of the people. Perhaps the old regime, not truly in cahoots with them, will give four years to watch them fail in handling every crisis they inherit, and others to be provoked along the way. Then, finally, Islamism can be dismissed without weapons or prison terms – the ineffective methods of the traditional status quo. The second and third possibilities return the conspiracy to the international scene. The United States (Israel features less prominently here) desire Islamist rule perhaps to foster regional stability in accordance with democratic principles. Egypt is Muslim, let the pro-business and pragmatic Brotherhood rule, and we can get on with our lives without incessant instability from Cairo. Or, in the apocalyptic scenario, the United States desires another eventual enemy. The war on terrorism is running thin, with the only current conflicts parried about through drone warfare. The military-industrial complex needs more than that. The region – through Islamism – must become stronger to at least enable another Cold War. This will permit defense contracts to remain plumb parcels of every budget for years to come. Unfortunately, this scenario works well to prove the depth of depravity to which conspiracy thinking leads. Unfortunately further, this is the reality in which Egypt is currently operating. Perhaps the Mubarak verdict was perfectly just given the standards of law. The standards of revolution, however, are always murkier.